Author contributions: Li H wrote the initial draft and revised the manuscript; He T and Xu Q revised the initial manuscript; Li Z, Liu Y and Yang BF conducted the literature review; Li F edited the language; Liu CZ contributed to the overall focus and content and helped revise the paper; all authors read and approved the final manuscript. Supported by National Natural Science Foundation of China, No. 81222050 and No. 81303122; Beijing Natural Science Foundation, No. 7144215; Beijing Municipal Administration of Hospitals Clinical Medicine Development of Special Funding Support, No. ZYLX201412; financially supported by 973 Program under Grant, No. 2014CB543203. Conflict-of-interest statement: All authors have no conflict of interest related to the manuscript. In China, acupuncture has been considered an effective method for treating gastrointestinal (GI) dysfunction diseases for thousands of years. In fact, acupuncture has gained progressive acceptance from both practitioners and patients worldwide. However, the therapeutic effects and underlying mechanisms in treating GI dysfunction have not yet been established due to a lack of systematic and comprehensive review articles. Therefore, the aim of this review is to discuss the efficacy of acupuncture as a treatment for GI dysfunction and the associated underlying mechanisms. A search of PubMed was conducted for articles that were published over the past 10 years using the terms “acupuncture”, “gastrointestine”, and other relevant keywords. In the following review, we describe the effect and underlying mechanisms of acupuncture on GI function from the perspectives of GI motility, visceral sensitivity, the GI barrier, and the brain-gut axis. The dual regulatory effects of acupuncture may manifest by promoting gastric peristalsis in subjects with low initial gastric motility, and suppressing peristalsis in subjects with active initial motility. In addition, the regulation of acupuncture on gastric motility may be intensity-dependent. Our findings suggest that further studies are needed to investigate the effects and more systematic mechanisms in treating GI dysfunction, and to promote the application of acupuncture for the treatment of GI diseases. Core tip: Acupuncture has been used as an appropriate adjunctive treatment for gastrointestinal (GI) dysfunction diseases. However, the therapeutic effects and underlying mechanisms in treating GI dysfunction have not yet been established due to a lack of systematic and comprehensive review articles. This review clarifies the effects and underlying mechanisms of acupuncture on GI function from various perspectives including GI motility, visceral sensitivity, the GI barrier, and the brain-gut axis. In addition, the dual regulatory effects and the intensity-dependent nature of acupuncture on GI motility are discussed. Acupuncture has been an integral part of traditional Chinese medicine (TCM), with a history tracing back more than 3000 years. In principle, acupuncture is a method by which yin and yang can come into balance with one another and qi can flow harmoniously throughout the body. In addition, De-qi, a composite of unique needle sensations in patients, including soreness, numbness, heaviness, fullness, warmth, coolness, tingling, and dull pain, is an efficacy predictor and parameter for assessing clinical effectiveness of acupuncture. However, only when qi is achieved will acupuncture be recognized as effective in the process of treating diseases. In China, acupuncture, a therapy that involves inserting the tips of thin, stainless steel needles through the skin at specific points, has been widely used in clinical practice to treat various diseases and physiological disorders. The procedure can be accomplished by manual manipulation or electrical stimulation. Manual acupuncture involves the manipulation of the inserted needles by hand, such as lifting, thrusting, twisting, twirling, or other complex combinations. Electroacupuncture (EA) is a modification of the traditional acupuncture and involves stimulating acupoints with an electrical pulse instead of manual manipulations. Gastrointestinal (GI) diseases are a significant burden to society. In 2004, GI diseases were reported to affect an estimated 60 to 70 million United States citizens, and to total approximately $142 billion in direct and indirect costs. To alleviate this burden, it is necessary to identify an economical means of treating GI diseases. Consequently, increased attention has been paid to studying the efficacy and related mechanisms of acupuncture in treating GI diseases. Acupuncture is beneficial as an alternative therapy for the management of chemotherapy-induced nausea, postoperative nausea and vomiting[8,9], peptic ulcer disease and postoperative ileus, as well as other functional disorders[12-14] including irritable bowel syndrome (IBS), constipation, and diarrhea. These effects of acupuncture occur through regulation of GI motility, protection of the stomach mucosa, and a decrease in visceral sensitivity[18-20]. For example, acupuncture at zusanli (ST-36), a classic acupoint, may improve upper and lower abdominal symptoms and restore impaired gastric slow waves, which are induced by rectal distension (RD), via the vagal pathway. Moreover, EA at Foot-Yangming meridian (SMFY) may enhance gastric motility and improve gastric mucosal blood flow by regulating the concentration of motilin and somatostatin in sinus ventriculi and bulbus medullae. A search of PubMed articles published between the beginning of 2005 and 2015 was conducted using the search term “acupuncture” in combination with the terms “gastrointestinal motility”, “gastric mucosa”, “intestinal mucosa”, “intestinal barrier”, “visceral sensitivity”, “brain-gut axis”, or “brain-gut peptide”. Sixty-five articles associated with acupuncture and GI regulation were selected from the publications obtained through the conduct of the literature search. In this review, four aspects of the regulatory effects of acupuncture on the GI tract are discussed including the modulation of GI motility, the GI barrier, visceral sensitivity, and the brain-gut axis. GI motility maintains healthy digestive function through the contraction and expansion of smooth muscle in different sections of the GI tract[23,24]. The characteristic motility pattern in the interdigestive period is referred to as an interdigestive migrating contraction. In research, gastric myoelectrical activity (GMA), multichannel electrogastrography (EGG), and gastric pressure are often used to assess GI motility[26-30]. Acupuncture may have regulatory effects on GI motility, especially on the motility of the stomach and colon (Table 1). Table 1 Effect of acupuncture on gastric and colonic motility. Organ Subjects Methods Findings Ref. ↑, increase; ↓, decrease. EA: Electro-acupuncture; ST-36: Zusanli; CV-12: Zhongwan; PC-6: Neiguan; RD: Rectal distension; GV-1: Changqiang; ST-25: Tianshu; BL-25: Dachangshu. According to TCM, one characteristic of acupuncture is that it has opposite regulatory effects during different physiological conditions. For example, acupuncture may promote gastric peristalsis in subjects with low initial gastric motility, but it may suppress peristalsis in subjects with active initial motility. One study involving 65 healthy volunteers found that manual acupuncture at ST-36 and neiguan (PC-6) decreased normogastria and increased bradygastria; however, the study did not provide evidence to support that acupuncture was more effective than sham acupuncture. Moreover, the results of several clinical studies indicated that acupuncture at hegu (LI-4) and PC-6 inhibited the excessive GI motility induced by mosapride citrate, and enhanced the suppression of loperamide-induced conditions, but these effects were not observed under normal conditions[33-35]. Similar outcomes have been noted in laboratory settings. Acupuncture applied at PC-6 or ST-36 in rats significantly enhanced gastric motility, while stimulating zhongwan (CV-12) significantly suppressed gastric motility. Iwa et al suggested that in rats, EA at ST-36 not only promoted gastric peristalsis, but also inhibited the acceleration of stress-induced colonic transit due to restraint. When acupuncture was applied at the changqiang acupoint (GV-1), colonic motility was also inhibited in healthy dogs through a decrease in the total duration and frequency of the contractions. The results of these studies indicate that acupuncture has a dual regulatory effect on GI motility and supports the TCM theory that acupuncture restores the balance between the yin and yang. The pathways, transmitters, and modulators of the nervous system are important factors in the regulation of GI motility (Table 2). In diabetic rats, EA at ST-36 has been shown to normalize contractions of the gastric antrum. This effect was partly related to an enhanced SCF/c-kit pathway which plays a critical role in maintaining the survival and proliferation of cells of Cajal (ICCs)[40,41]. ICCs, which act as a pacemaker in the GI tract, play a crucial role in the generation of slow waves and the control of gastric movements. In rats with burns, EA at ST-36 improved postprandial gastric dysrhythmia, and delayed gastric liquid emptying via the enhancement of vagal activity, which indicated that the accelerative effect of EA on gastric motility might be blocked after a vagotomy. Acupuncture at the acupoints in the limb promoted gastric motility via a supra-spinal reflex that activated the vagal nerve fibers, while the same stimulus to the abdomen resulted in the reverse effect via a spinal reflex that activated sympathetic nerve fibers[44-46]. Moreover, EA at ST-36 has been found to enhance gastric motility via the efferent parasympathetic pathway, whereas stimulating CV-12 has been found to inhibit GI motility via the efferent sympathetic pathway[47,48]. Furthermore, the inhibitory effect of EA on gastric motility may be intensity-dependent. In wild-type mice, EA at an intensity of 1 mA at CV-12 produced no significant effect on gastric motility. In contrast, gastric motility was significantly inhibited by EA stimulation at intensities of 2 mA and 4 mA. However, the intensity-dependent characteristic disappeared following the blockage of the TRPV1 channel, which indicated that TRPV1 was partially involved in the EA modulation of gastric motility. Strong manual acupuncture stimulation applied in rats at ST-36 or CV-12 produced a more significant enhancement or inhibition on gastric motility compared with slight stimulation. In this case, the intensity of manual acupuncture stimulation depended on the twisting frequency of needle manipulations and De-qi sensation. And the effect was more likely to be mediated via A-delta and C-afferent fibers. Similarly, Iwa et al reported that EA applied in freely moving conscious rats might promote distal colonic motility and accelerate colonic transit via a sacral efferent parasympathetic pathway. The stimulatory effect of EA on stress-induced delayed gastric emptying was blocked by pretreatment with an intracerebroventricular injection of kynurenic acid, a glutamate receptor antagonist, which suggested that the glutamate receptor was involved in the regulation of gastric motility. Glutamatergic receptors are classified as either N-methyl-D-aspartate (NMDA) receptors or non-NMDA receptors. NMDA receptors, which are associated with vagal afferent nerve fibers, may play a critical role in mediating gastric motility. When anesthetized rats were microinjected with AP5, an antagonist of NMDA receptors, the increased gastric pressure that was induced by low frequency electric stimulation at ST-36 significantly decreased[30,53]. In addition, acupuncture could improve the GI symptoms associated with stress by up-regulating the expression of hypothalamic oxytocin (OXT), which is an anti-stressor agent. Table 2 Mechanisms of acupuncture on gastrointestinal motility. MA: Manual acupuncture; EA: Electro-acupuncture; ST-36: Zusanli; RD: Rectal distension; CV-12: Zhongwan; NMDA: N-methyl-D-aspartate; TRPV1: Transient receptor potential vanilloid-1; TENS: Transcutaneous electrical nerve stimulation; OXT: Oxytocin. The GI barrier, which is a component of GI defense, protects the epithelium from harmful microbes and toxins. Impairment of the mucosal barrier primarily results from mucosal ischemia/reperfusion injury, inflammatory response, excess gastric acid secretion and bacterial infection[56-60]. Acupuncture may be helpful in restoring GI barrier injury by regulating the neuron-endocrine-immune system and antagonizing the inflammatory response. In duodenal ulcer patients, acupuncture has been shown to reduce the acid output and to achieve symptomatic relief. EA at ST-36 provided protective effects against gut injury and mucosal barrier dysfunction in hemorrhaged rats by activating the cholinergic anti-inflammatory-dependent pathway and enteric glial cells which are known to secrete pro-epidermal growth factor and thereby increase epithelial restitution[62-65]. The anti-inflammatory effect of acupuncture has the potential to significantly prevent postoperative intra-abdominal adhesion formation, which is a leading cause of small bowel obstruction. The loss of intestinal barrier function and epithelial cell integrity induced by gut ischemia/reperfusion injury could promote the systemic production of various inflammatory mediators and activate leukocytes, which may lead to remote organ injury. In rats with ischemia/reperfusion injury, the anti-inflammatory effect of EA at ST-36 has been shown to prevent the injury to the intestinal barrier and remote organs via the activation of the α7 subunit of nicotinic receptor and the cholinergic anti-inflammatory-dependent pathway. Stress-induced mucosal diseases occur with local ischemia. In rats with stress-induced gastric ulcers, EA at ST-36 aided in the repair of the stomach mucosa by increasing the concentration of epidermal growth factor in gastric mucosal tissue[70,71]. The protective effect of EA on the gastric mucosa may be related to an increase in the expression of the intestinal trefoil factor gene and SS-R1mRNA in gastric mucosal tissue, which may promote mucosal restoration[20,72,73]. As a neurotransmitter, nitric oxide (NO) has both protective and deleterious effects on the gastric mucosa, depending on the type of nitric oxide synthase (NOS, i.e., NOS1, NOS2, or NOS3). EA applied at ST-36 in rats has been shown to increase the expression of NOS1, but decrease the expression of NOS2 and NOS3, resulting in the protection of the gastric mucous. Prior research has indicated that excess gastric acid secretion may cause GI mucosal lesions. Furthermore, plasma beta-endorphin (β-EP) and somatostatin (SS) inhibit acid secretion[76,77]. Following the intragastric administration of a mixed amino acid meal to dogs, EA at ST-36, PC-6, and pishu (BL-20) suppressed acid secretion and significantly increased β-EP and SS simultaneously. Moreover, the inhibition of acid secretion by EA was significantly greater than inhibition observed following sham EA. IBS is characterized by chronic or recurrent abdominal pain, discomfort, and/or altered bowel habits (i.e., diarrhea, constipation or both) that often interfere with the daily life of a patient[79,80]. Clinically, acupuncture has been acknowledged as an effective treatment for abdominal pain in IBS patients, although some acupuncture trials failed to demonstrate superiority over a placebo treatment in patients who have IBS[81-83]. Chronic visceral hypersensitivity (CVH) is an important and characteristic feature of IBS. In rats, EA at bilateral points of ST-36 and shangjuxu (ST-37) significantly attenuated CVH that was induced by neonatal colon irritation. This effect was not observed following sham-EA at ST-36 and ST-37 without electrical stimulation, or following EA at control points, shenmai (BL-62), and the tail, which not only confirmed the acupoint specificity but also accounted for the placebo effect of EA. The antihyperalgesic effect of acupuncture may be mediated via the opioidergic, adrenergic, and serotonergic pathways in both the central and peripheral nervous systems. In rats with heterotypic intermittent stress (HIS), EA delivered at acupoint ST-36 for 30 min in both hind limbs significantly attenuated the hypersensitive responses to colorectal distention compared with sham EA treatment. In contrast, the analgesic effects were blocked by pretreatment with naloxone, an opioid receptor antagonist, which suggested that the opioid pathway was involved in the regulation of visceral hypersensitivity by acupuncture. Serotonin (5-HT) hyperactivity is known to increase visceral sensitivity in the enteric nervous system. This is supported by the effectiveness of the 5-HT3 receptor antagonist in treating IBS. Several studies have shown that EA at ST-36 decreased visceral sensitivity and produced an analgesic effect in rats with CVH via the serotonergic pathway[87,88]. In response to colorectal distension, Chu et al used the abdominal electromyogram (EMG) as the measurement index for visceral hypersensitivity in rats with CVH, and found that the inhibitory effect of EA at ST-36 on visceral hypersensitivity may be mediated by the 5-HT3 receptor in colon tissue. However, a study performed by Liu et al suggested that EA at tianshu (ST-25) and ST-37 reduced the concentration of 5-HT by activating the 5-HT4 receptor, which indicated that the 5-HT3 receptor may not be involved in the regulation of the visceral pain threshold in CVH rats. These conflicting results may be partially due to the application of different acupuncture points in the two experiments. When EA was applied at ST-36 and ST-37 in CVH rats, the abdominal withdrawal reflex (AWR) decreased, and the pain threshold pressure (PTP) increased. Furthermore, the high expression levels of phosphorylated NMDA receptor subunit (pNR1) in the spinal cords (L4-L5 segments) of CVH rats was markedly attenuated by EA treatment. Aside from the peripheral nervous system, the central nervous system plays an important role in the regulation of visceral sensitivity by EA. Corticotropin-releasing hormone (CRH) has been shown to increase rectal sensitivity, which was inhibited by the administration of α-helical CRH, an antagonist of the CRH receptor[91,92]. In IBS model rats, EA at ST-37 significantly decreased the visceral sensitivity and hypothalamic CRH levels compared with the untreated IBS model rats. Therefore, it is possible that EA can moderate visceral sensitivity by regulating the hypothalamic CRH concentrations in the rodent IBS model. The brain-gut axis is a bridge that connects the CNS and GI tract. By means of the brain-gut axis, signals from the brain influence the sensory, motor, and secretory modalities, as well as the microbiota of the gut. Conversely, visceral messages from the microbiota may influence brain functions. The brain-gut axis involves the CNS, autonomic nervous system (ANS), hypothalamic-pituitary axis (HPA) and brain-gut peptides. A functional magnetic resonance imaging (fMRI) study of the human brain demonstrated that manual acupuncture at ST-36 modulated neural activity at multiple levels in the cerebro-cerebellar and limbic systems. Further, the anterior cingulate cortex, prefrontal cortices, and the caudate tail may play a role in processing gastric perceptions in functional dyspepsia (FD) patients. Acupuncture could deactivate the primary somatosensory area and the cerebella, and could activate the visual-related cortex. Brain-gut peptides, which are distributed along the GI tract and in the central nervous system, are involved in the modulation of GI tract processing[22,94]. Tachykinins, as exemplified by substance P (SP), participate in important physiological processes in GI systems including smooth muscle contractility, epithelial secretion, and proliferation. A reduction in the secretion of SP and vasoactive intestinal polypeptide (VIP), an inhibitor of GI motility, could contribute to the major effects of EA when treating rats with IBS. Motilin and cholecystokinin (CCK) are peptides that are known to be potent regulators of GI motility. In a study by Niu et al, EA at ST-36 significantly increased the secretion of motilin and CCK, which could be the mechanism by which acupuncture enhanced the GI myoelectrical activity of conscious rabbits. Further, evidence suggested that the orexigenic peptides, including ghrelin and neuropeptide Y (NPY), could be down-regulated by EA and could stimulate decreased food intake in rats. Although acupuncture has been used as an appropriate adjunctive treatment for GI dysfunction diseases, the underlying mechanisms have not been clearly understood. Currently, there are no systematic and comprehensive review articles that clarify the regulatory effect of acupuncture on GI function. In this review, we discuss the regulation on GI function through acupuncture from the perspectives of GI motility, the GI barrier, visceral sensitivity, and the brain-gut axis. The results of studies in both humans (Table 3) and animals suggest that acupuncture has the potential to treat GI disorders by regulating GI motility, the GI barrier, visceral sensitivity, and the brain-gut axis. In addition, the dual regulatory effects and the intensity-dependent nature of acupuncture on GI motility are discussed. According to classical acupuncture theory, acupoints are important reflex points of visceral dysfunction. Different acupoints have various therapeutic effects. 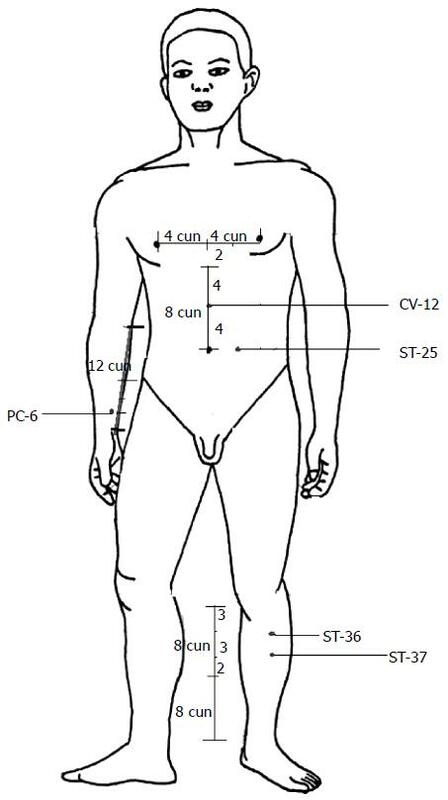 ST-36, PC-6, ST-37, CV-12, and ST-25 are the primary acupoints used in the treatment of patients or animals with GI disorders (Figure 1), which suggests the specificity of acupoints. The duration and frequency of acupuncture manipulation are important parameters for the success of the therapy. Thus future studies should incorporate optimized methodologies that account for the selection of acupoints and stimulation parameters. The mechanisms underlying the beneficial effects of acupuncture may be associated with the pathways and transmitters of the nervous system. However, the mechanisms behind the involvement of brain-gut peptides in acupuncture and GI regulation have not been established because there are no known antagonists available to serve as controls in experimental studies. Although manual acupuncture and EA are both effective in regulating GI disorders, it is still unclear which method is more effective in certain conditions. Further investigation of the efficacy of acupuncture on multiple targets may be more likely to inspire scientific interest. Furthermore, to elucidate the roles and mechanisms of acupuncture in GI regulation and new therapeutic approaches for treating various GI diseases, proper controls are required in future studies. Figure 1 Location of acupoints often used in gastrointestinal regulation. Table 3 Clinical trials associated with acupuncture and gastrointestinal Regulation. Trial design Subjects Method Acupoints Result Ref. ↑, increase; ↓, decrease; -: No effect. GI: Gastrointestinal; RCT: Randomized controlled trial; LI-4: Hegu; PC-6: Neiguan; ST-36: Zusanli.